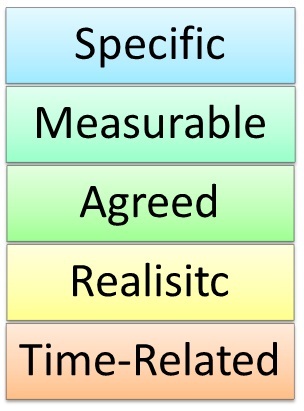 This is often used as a guide to define objectives in the workplace. Objectives need, as I have discussed in an earlier post called ‘whose objectives was it again?’, to be defined and clear. This guide is helpful but when we look at it more in-depth some issues will arise. Agreed objectives is as discussed in the post linked to above important to make sure that there exists a common understanding of who the objective will benefit. It is also easy to argue for goals to be realistic instead of unrealistic. Even though we could argue that sometimes an almost unrealistic goals can be realistic. I will leave that discussion for a later post and focus on the three remaining aspects of SMART, specific, measurable and time-related. By making an objective to specific you might in fact inhibit creativity and initiative. Each situation is different and over time it might change. For example, a person working in sales might have several different products to sell. Over any given time the demand for his products might change. If the sales target is very specific ‘sell 200 units of x product’ a change in customers preference might change and the seller pushes to sell the wrong product. This is a missed opportunity which could have been avoided with more flexibility. An objective could still be specific, but leaders must ensure that there exists a possibility to be flexible. ‘What gets measured gets done’ is an old saying used by managers. From a performance management perspective measurable means a way to assess performance. It is a tool in the assessment process, not an end in itself. There are so many factors that influence performance in an organization so it is very hard to know what to focus on. Therefore, having a measurable goal might change behavior especially when individual factors are measured. What is being measured becomes the goal and not the effect the performance has on other aspect of the objective. For example, objectives in the health care sector might put patients care in danger because the target becomes more important than the real need to care for patients. By the time we are able to measure the results it’s too late. Measuring what happens will not tell you why it happened. The focus should be on the individual doing the objective, are they doing it the ‘right way, or doing ‘the right things’. If they are, this behavior should be encouraged instead on focus on the outcome even if it is not satisfactory. Time-related means that there is a deadline. This dead-line is in itself a goal and will therefore have the same issues as other goals and objectives. In this sense a deadline should be realistic, achievable and rational. Short deadlines will damage moral and not improve effectiveness. As with the other aspect, flexibility is the key. Sometimes deadlines must be altered due to different unforeseen circumstances. To summarize, the key thing to think about when setting objectives for employees is to allow for flexibility. In this fast-pacing economy change happen in a blink of an eye. Being stuck in old bureaucratic habits will inhibit growth and innovation. What is your experience with SMART goals and other types of setting of objectives in your organization? Normally I do not read post on blogs, however I would like to say that this write-up very forced me to try and do so!